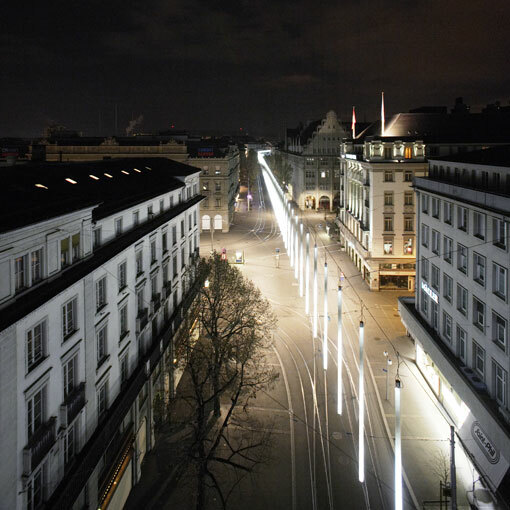 ” ‘Distinctive, generous, unique’—these were some of the qualities expected of the Christmas illuminations in Zurich’s internationally renowned shopping street. ….We designed a continuous band of lights, 1.1 km long, using 275 tubes of light, which we called “The World’s Largest Timepiece”. The 7 m high, round tubes had to provide light evenly in all directions, and be able to withstand heavy windloads despite being light in weight. We therefore had to find a rigid, robust casing material that would also transmit light. Eventually we chose wound glass fibre technology: a special manufacturing process in which glass fibres are soaked in resin and spun around a mandrel. We were fascinated by the additive logic of this process. The winder controls the stacking of the fibres via two computer-coordinated movements. A sliding carriage drives the glass fibres back and forth along the spinning mandrel, creating an extremely stable multi-layered tube. The stacking winder and the number of tiers and overlappings determine the rod’s flexural rigidity and torsional stiffness, as well as its transmission of light. … The final tube was 7 m long and 15 cm in diameter, but its shell was only 2 mm thick; including the lighting and control technology, it weighed just under 23 kg. Intense engagement with the computer-operated production process allowed us to integrate two normally incongruent requirements into a single material, thus using wound glass fibres for lighting on this scale for the first time. During the Christmas season the Bahnhofstrasse is illuminated for eight hours every night, with a constant flow of changing light sequences. Designing this 320-hour urban environment was an innovative, exciting and demanding task that stretched the classic architectural repertoire to include the algorithmic design of time-based sequences. Thank You from MAS 2016! Nominees for the Media Architecture Awards 2016 announced!